The high cost of reworking a project can be greatly reduced or eliminated through grade control technology, including the use of GPS (Global Positioning System) and drones. Grade control equipment is designed to help streamline project planning, improve construction management, eliminate rework, and keep the project budget in check. This technology was first implemented in 2002 on bulldozers and initially was installed on 1% of machines. "Now approximately 10% of new equipment supports grade control," Kelly Snively, Grade Control Specialist for Papé Machinery said. Snively sees inaccurate plans as a major contributor to costly rework and estimates that grade control technology can save money in production, man-hours, and hourly wages by 25% or more. According to " Learning Practices as a Tool for Quality Costs Reductions in Construction Projects " published in the journal "Quality - Access to Success," rework can often be as high as 5% of the contract value of a given project. That means it costs $250,000 worth of rework for every $5 million spent on a job. A different study conducted by Navigant Construction Forum suggested that the 5% average cost of rework on the construction budget was merely the price associated with the direct cost of reported rework and that the actual total is closer to 9% of the total project cost when indirect expenses like field supervision and overhead are taken into account. Another study, " Cost Management in Construction Projects: Rework and Its Effects ," published in the “Mediterranean Journal of Social Sciences,” found that about 30% of the work performed by construction companies is actually rework. Despite the differences in the amount of estimated rework ranging from 5-30%, most contractors agree that they lose too much money and allocate too many resources to rework. Publisher Machine Guidance conducted a comparison test and concluded that despite up-front expenditure on machine guidance products, using grade control technology compared to the traditional survey stakeout method resulted in considerable project savings. The survey found savings could run as high as 88% by using installed grade control systems. The determination excludes the additional cost benefits achieved by reduced field labor requirements. Errors resulting in the need for rework can happen at any time during a project, but are particularly costly if they happen early in project planning and are not caught until the final survey. "An error made at the initial stage can be carried through the planning and construction without checks," Snively said. "Technology helps eliminate human errors; work is repeatable and there are automatic double checks all day long. Plus, with tech, you buy it once and you never have to pay the machine again. It does the job every day without pay." The traditional surveying and grading process is expensive and time consuming. With the advancements of new technology, the need for manual surveying and highly experienced equipment operators has been nearly eliminated. A construction drone can complete a survey in a fraction of the time of a surveyor and produces an exact topographic map of the site that engineers can use to plan. Once the plan is complete, that data can be input into the SmartGrade system which creates easy on-screen directions any operator can follow to redistribute dirt to the right places on the job site so it doesn't have to be added or removed. "With grade control, one of the things people talk about is GPS – the easy or automatic button," Snively said. "The machines get turned on every day, and with the push of a button, it does what it needs to do." Snively added that use of grade technology can help construction crews grade faster, grade more precisely, and do it with fewer workers. Grade control technology can now be installed on all job site equipment including the dump truck and excavator. "On an excavator, for example, it can guide operators to the desired depth and slope by telling them exactly where the bucket should be positioned," Snively said. Contractors interested in grade control technology need not replace existing grading equipment to put it into use. They can also have it added to older models. For companies looking into buying new equipment, manufacturers now offer several grade control system choices. 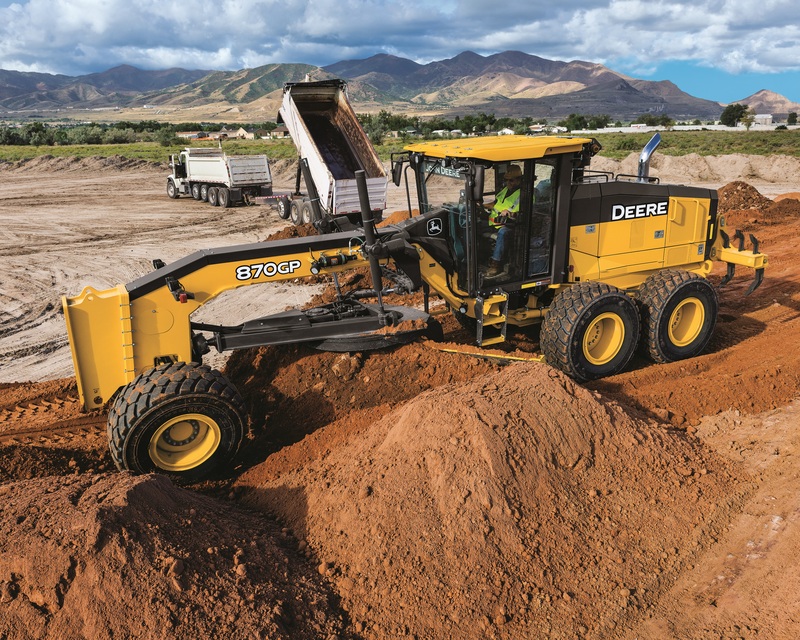 Grade-control-ready dozers or motor graders from John Deere come pre-plumbed, wired and ready for easy installation of various grade control systems including Topcon, Trimble , or Leica . For more information about grade control technology or for a demo, contact the experts at your nearest Papé Machinery Construction & Forestry location.